Harding University at Searcy is the largest of the 11 AICU member institutions with almost 7,000 students representing more than 50 nations. Building on the qualities that have marked the school since its founding, Harding was recognized in October 2002 as the first Campus of Character by the International Association of Character Cities, an association of the Character Training Institute in Oklahoma City. 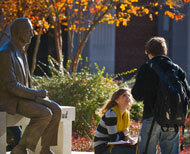 This unique designation followed the passage of a resolution by the university’s board of trustees declaring that Harding would do everything possible to promote character on campus and beyond. Harding University is a private Christian, liberal arts university located in Searcy, Arkansas. Committed to pursuing academic excellence and establishing strong spiritual foundations, the University attracts students representing all 50 states and 54 nations and territories. Harding offers 10 undergraduate degrees in more than 100 majors and 14 pre-professional programs. Master’s degree programs are offered in business, clinical mental health counseling, education, marriage and family therapy, ministry, nursing, school counseling, speech-language pathology, and physical assistant studies. Doctoral programs are offered in Bible, education, pharmacy and physical therapy. Educated with a global perspective, nearly half of all students take advantage of an international experience through Global Missions Experience; spring break missions; or study abroad programs in Australasia, Chile, England, France, Greece, Italy and Zambia.